Have you ever wondered how to make fondant decorated cookies? 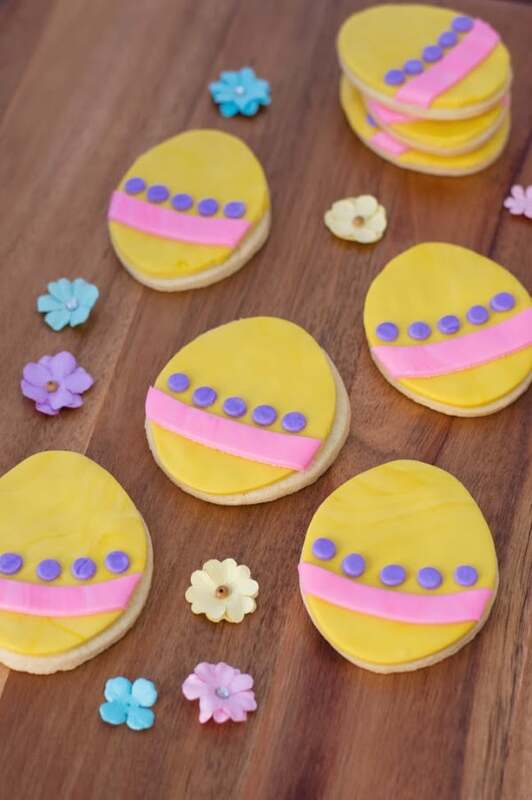 It is easier than you think and these Easter fondant cookies are a great way to try your hand with fondant. It is a great decorating recipe for kids to participate in too! Hello Friends! Today is a fun day to learn something new – at least for me. I have never really worked with fondant before although I have admired all of the possibilities of what you can make with it. I always see all those lovely cakes that they make on Cake Wars with the fondant and wanted to try using it for decorating cookies. I also saw it used a lot at the cookie convention a few years ago. Sprinkle flour on a clean working surface then, coat a rolling pin with flour. 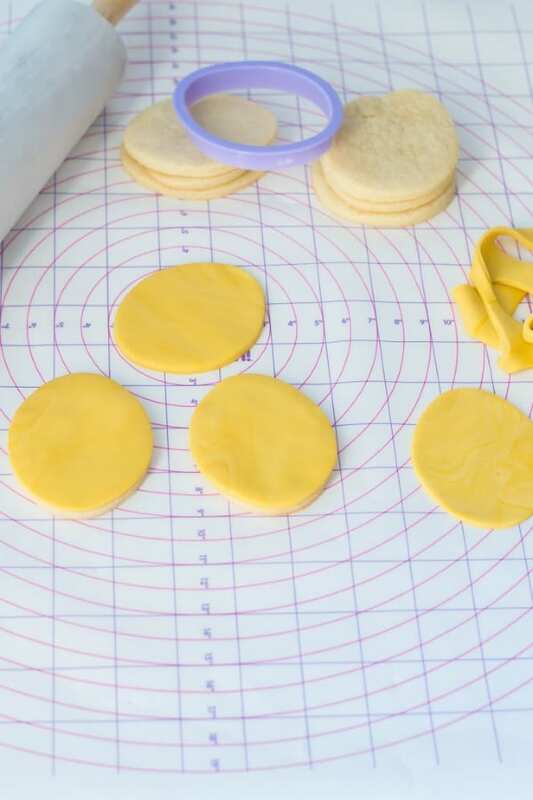 On the coated surface, roll out your sugar cookie dough until it’s about ¼ of an inch thick. 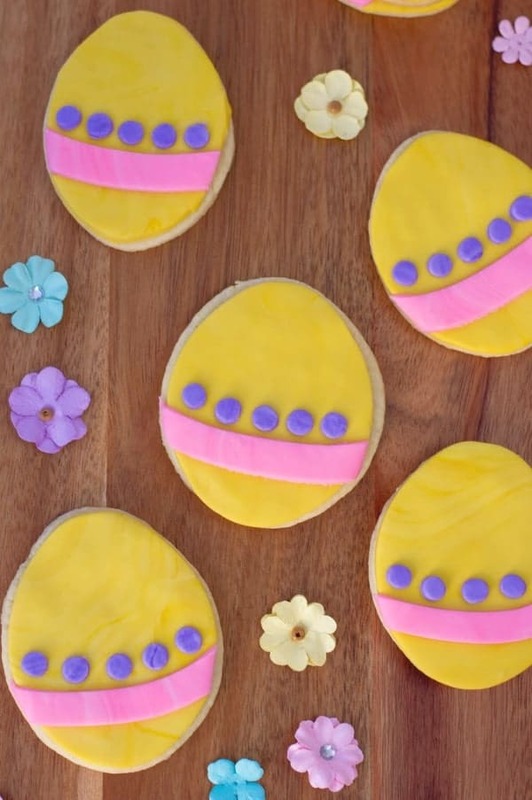 Using your egg-shaped cookie cutter, cut out 12 eggs from your cookie dough. Save the rest of the cookie dough (if any!) in plastic wrap and refrigerate for your next recipe! Bake in cookies as directed in the recipe. Once the cookies have baked, allow them to cool completely on a wire rack. 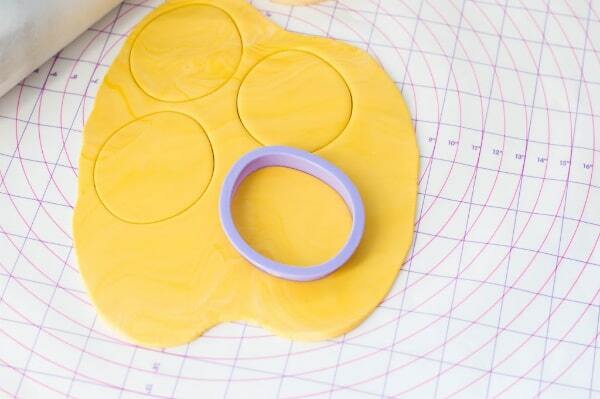 Roll out your fondant so that it’s about ¼ of an inch thick. 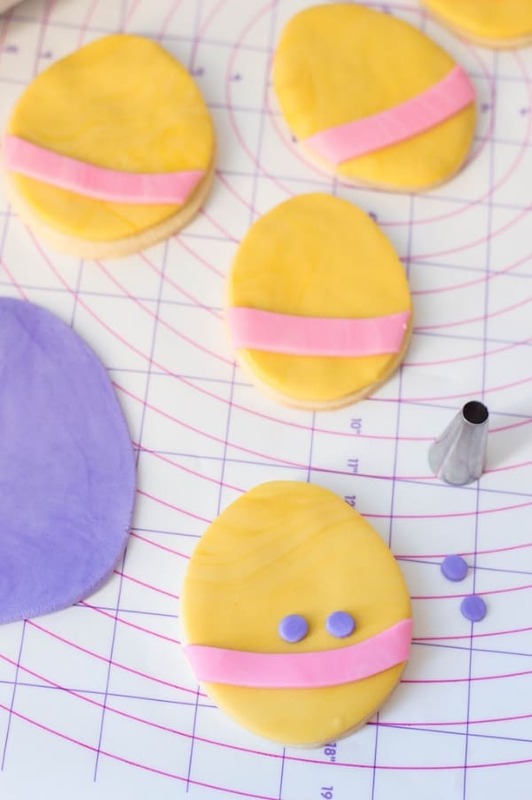 Using the same egg-shaped cookie cutter, cut out one dozen egg-shaped fondant pieces. You will want 12 of them. Roll out pink fondant so that it’s about ¼ of an inch thick. Using a paring knife, cut out strips, about ½ an inch wide and 3 inches long. Place on pink strip on each cookie, on a slight curve. Trim any excess. Roll out purple fondant, about ¼ of an inch thick. Using Wilton tip #11, cut out 60 purple fondant pieces. Place 5 purple circles on each cookie, just above the pink stripe. I recommend starting with the middle circle and working your way out – this ensures that the circles look even and centered. You can save time with this recipe by using refrigerated or packaged sugar cookie dough. Sometimes you can find undecorated sugar cookies at the grocery store, and those would work well for this recipe too. This tutorial is brought to you by my friend, Lisa Marie, hope you enjoyed it! I love Lisa Marie! And I love these cookies!! They’re works of art.